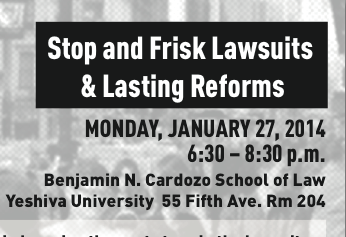 Are you interested in learning the next steps in the lawsuits against Stop and Frisk? 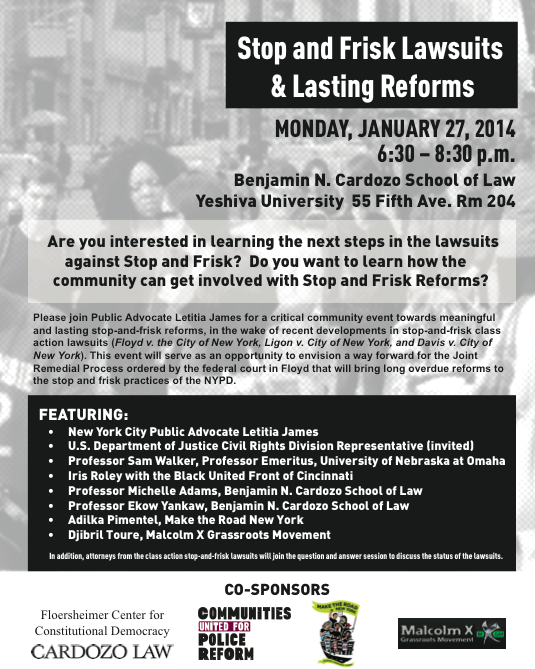 Do you want to learn how the community can get involved with Stop and Frisk Reforms? Please join Public Advocate Letitia James for a critical community event on the path towards meaningful and lasting stop and frisk reforms in 2014 in the wake of recent developments in the stop and frisk class action lawsuits, Floyd v. the City of New York, Ligon v. City of New York, and Davis v. City of New York. This event will serve as an opportunity to envision a way forward for the Joint Remedial Process that will bring long-overdue, lasting, and meaningful reforms to the stop and frisk practices of the New York Police Department. Panelists will include experts from across the U.S. and leaders in the police-accountability movement here in New York to discuss the importance of this critical opportunity. In addition, attorneys from the Floyd, Ligon, and Davis lawsuits will join the panelists for the question-and-answer session to address questions about the status of the lawsuits.